Trim the UNDER side to the correct length (across point A1) for a male or female dog by measuring from the underside of the dog's neck down along the belly to his/her privates. Sew the UNDER side to the body at the points as indicated in the pattern, be sure not to sew the arc sections as these will make the leg holes. Flatten the legs with the seam side facing inward and the arc facing outward, tilt the bottom front legs on a 45 degree angle out toward the front, and the rear legs in a slight angel toward the back and pin the arcs together. Pic for reference only, this pic is not to scale. Sew all 4 legs together along the arcs. (optional) add elastic into the rear-inside-bottom arc of the leg holes for a better fit. Cut the seam for the zipper down the middle of the back leaving 1.5" from the neck & sew in the zipper. Add the neck and leg cuffs. 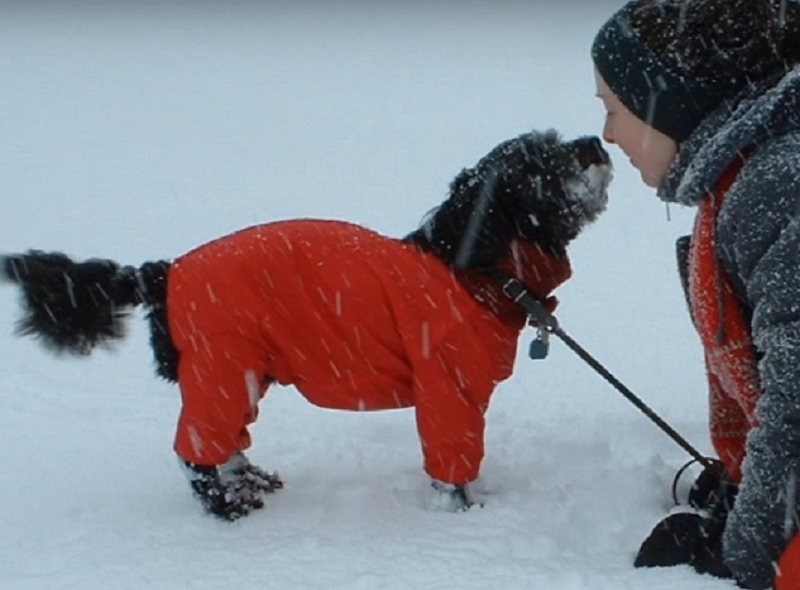 You can also double up this coat by making one in fleece to fit the dog and another a little larger in a nylon material, then sew the two together so that both inside seam works are against each other, then sew in the zipper, neck and leg cuffs. I would love to see pics of your little ones in their new coats! Anxiously awaiting instructions. This coat is so cute. I can't wait to try it. I cant wait to try this!! I agree. How do you scale it to size? I have doggies that are between 5 and 7 pounds. Thanx! Measure the dog from base of neck to where the til joins to the body (Along the back, the scale the pattern so that the measurement along the fold is the same as the back measurement of the dog. I dont undrstand the neck aspect of the pattern? Help! Managed to work out the neck! Thank you! But I am still having difficulty scaling up the pattern :( any hints? HI, I love this pattern but my problem is I need it for a large dog, standard poodle and a Doberman. I don't know how to adapt it, can you help me, please? After reading all the posts, if we just knew the inches per square, we might be able to determine the scale. Hi, Simply measure the length of the dog from base of neck, where the back of the neck meets the shoulder blades, down to the tail joint, then scale the pattern up from this measurement on the area along the bend (showing 11 blocks) fr example, if the dog is 17 inches long, the scale would be (1.54) scale up 154% for a 20 inch dog (1.82), Scale to 182% Then print over several sheets and tape them together. Hope this helps. I need a good dog boot pattern for a boxer/american bulldog cross. Something that will stay on her feet in the winter. Do you have a good pattern? Ideas?? Oh, he's divine - I love the character that some dogs have, they are definitely furry people! My friends have a little Boston Terrier and he's super. They have trained him to pause before getting the command allowing him to eat (they were hoping to stop him eating everything in sight as they took him walking). Only trouble is he took to it like a duck to water, and they didn't realise one night that they had forgotten to give him the 'eat' command before disappearing into the next room. An hour or two later they came back to him, still sitting in the kitchen staring at him dinner, poor baby. Thank you for the pattern. And what an awesome neighbor you are. 17 divided by 11 (11 squares or inches is the original pattern) is 154. Enlarge the print 154% for a dog that measures 17" length. A 20 inch length dog (from collar to the base of the tail) = 20 divided by 11 = 1.818 or round up to 182 - so you enlarge the pattern 182% to fit your dog. It's also easy enough customize the pattern for your dog with a few measurements. I trace the original pattern to a piece of cardboard, then I adjust it as needed since obviously every dog is shaped differently. For example, if you measure your dog from where his collar/I.D. tags sit on his neck (throat area or D in the Body diagram) to where the front of his leg is ("C" or where the hole for the legs begins) - that gives you the distance from D to C in the BODY diagram. Lengthen or shorten that line as needed. I also measure the distance between the two front legs, and that's the width of the "Under" diagram between the two concave curves, and I adjust measurements of A to B, and C to D to match those points on the BODY diagram. I did mine without the back legs as I only wanted a jacket to stop at the waist. 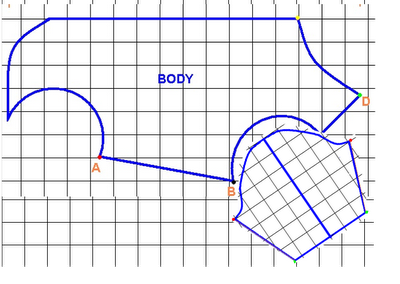 So I measured B to A - the distance from the armpit ("B", or the back of the armhole) to the bottom of the rib cage. This keeps it short enough so that the dog (male dogs in particular) don't pee on their clothing. I determined the "BODY" height by measuring my dogs girth (circumference) around the thickest part of his rib cage behind his front legs. 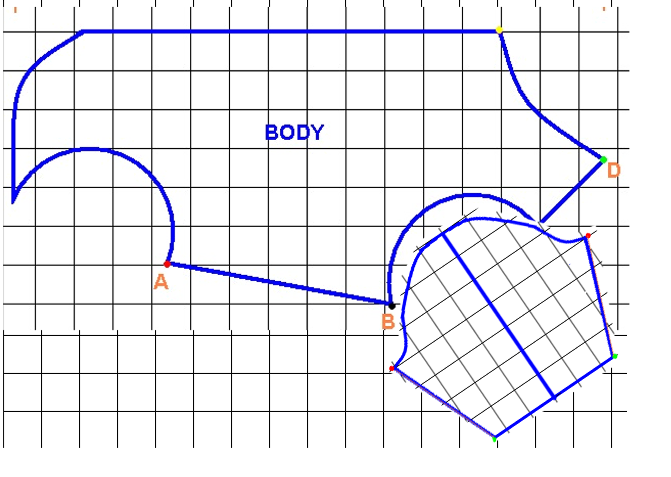 The "Body" measurement from top to bottom in the pattern would be 1/2 of that girth measurement (since you are cutting two pieces of fabric for the BODY or one piece "folded" over on the "bend"), plus add an inch for seam allowances. If the body is too big, you can always trim off the top to adjust the size until you get the right fit. Measure the neck circumference as well and add an inch plus your seam allowance. All sections should add up to the neck circumference plus those allowances. I made a test pattern with an old pillowcase for my chihuahua today before cutting into my good fabric. I'm assuming the "neck" in the diagram is an optional turtleneck. One thing I had to do also is measure the chest of the animal. My one dog is barrel chested so her length doesn't correspond to the neck/chest area. I increased the width of the bottom piece that fits at the neck to fix this issue. Thanks so much for the detailed description of measurements. It's just what I needed! I just saw this and I must say you are very clever in making this dog coat on your own or should I say make up in your head. Kudos to you. I love it Great Job and to think you did it all by hand. I love to sew by hand myself but these hands don't work like they use too. Thanks so much for sharing this with everyone. Once again - very much appreciated. Wow! You're a Genius !!!! How you manage to use old pants and socks to make this dog coat . I love the idea of long sleeves and the zipper in the back. Now that I know you can just about figure out anything, could you help me find a way to make something for dogie boots? I'm thinking something like suspenders so she won't be able to kick off? Thank you for sharing, God bless you. going to make one this weekend. my jack-chi is too cold and got a little sick this year. she can't go out for exercise. Hi, I also have problems with adjustments of pattern...the back of dog is 25inch long (from collar to the base of the tail) , but if I enlarge pattern to 227% it is still very small...? First of all, you are an awesome neighbour. I am having A LOT of problems with this. I have the front legs sewn on, by the looks of it, the top of the legs will be directly under the chin. C is the part that goes kind of under neck and across very front of chest? I am feeling really stipud that I cant figure this out. Click on each photo to enlarge it - Right Click - Save Image As" and save to your computer. Where do you download the pattern? Is it just the picture that i print out or is there a link. PLEASE help, trying to make my dog this in the next couple nights. Click on each photo to enlarge it - Right Click - Save Image As" and save to your computer then scale and print. Hello your marvelous by the way ! But I'm pretty new at sewing and the step 2 talks about bending? Do I bend the fabric and then cut it? sorry first project? I have three rescue dogs, they are very different to each other but all are long bodied and relatively slim, like greyhounds I suppose but one is Maltese the others cross. I find that every pattern and bought dog onsie is much too big around for them when I get the back length they need. Can I alter the pattern to take that into account? Also two have short legs! I'm making this now and find this pattern very easy to follow. Thank you for sharing. My little guy is going to be a lot warmer and get a lot more out door time this winter.